Living Colour! is a travelling textile art exhibition curated by Brenda Gael Smith and featuring the work of many Guild members including Jenny Bacon, Sue Dennis, Robyn Eves, Dianne Firth, Kay Haerland and Carolyn Sullivan. Living Colour! 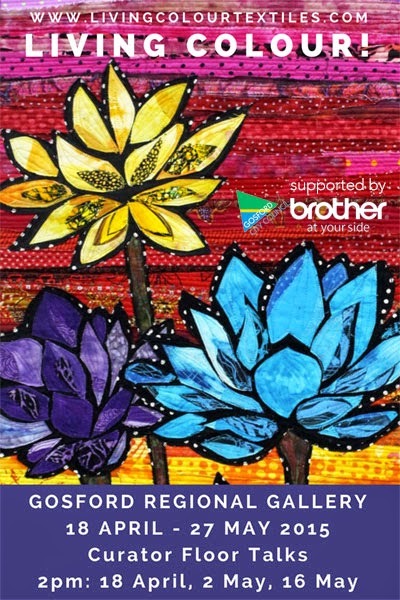 tours next to Gosford Regional Gallery, Gosford, Australia from 18 April – 27 May 2015. Come along to the opening and curator floor talk at 2pm on Saturday 18 April. Other curator floor talks at 2pm on Saturday, 2 May and Saturday, 16 May 2015. All welcome! Desperate Days call for Desperate measures!